WOW! This beautiful house has it all! Custom cabinets throughout the house, wonderful gas fireplaces with custom rock work, all new furnishings and appliances. The great room works for family gatherings along with the front deck with mountain views. House comes with enjoyable amenities such as a pool table and private hot tub. Central location, close to all South Shore activities. Four bedroom, three bath; three bedrooms have king beds, one has a queen bed. While we hope you and your group will have a memorable vacation with us, we cannot stress enough how important it is to abide by the City of South Lake Tahoe’s laws. Laws are now being enforced more strictly than before where citations will be issued to guests directly and also to owners with no warning. Citations are no less than $1,000. You will be responsible in paying both your fine and the owner's fine due to an ordinance violation. Please take a look at the following information and ask us any questions you may have. 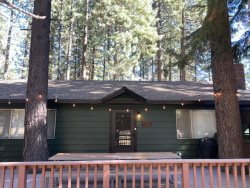 You may also view all regulations and all information on South Lake Tahoe’s website, http://cityofslt.us/vhr.